Born in Scotland, Derek has been described as a “Serial Entrepreneur” with 25 years experience in developing and marketing brands. He launched his first brand in March 1984 when he founded QuikFrame, instant picture framing and colour printing shops, in Edinburgh which he subsequently franchised, opening 20 retail outlets in the UK . 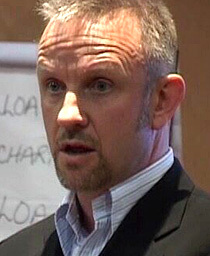 Derek founded “future factory ltd” in 1995 in response to a need for more practical approaches to Learning and Development. This unique response led to the creation of “Business Mirrors” in the form of experiential learning tools (www.futurefactory.co.uk). When not flying around the world Accrediting Consultants and Learning and Development Specialists in the use of “business mirrors”, he works as an organisation change coach. future factory now has over 1500 clients globally including: Scottish Power Standard Life, Royal Bank of Scotland, United States State Department, Google, Audi, Nike, Burberry, Motorola, who all use “business process mirrors” to navigate organisation change. He has worked extensively with key clients in the utilities sector, guiding them through the change of privatisation, opening up of competition, Acquisitions and Mergers and cultural integration. Over the years as an organisational change coach, he has worked throughout Europe, North America as well as Asia Pacific with numerous global organisations. He has lectured at Edinburgh Business School, where he co-founded the Consortium MBA specialising in the Mergers and Acquisitions elective. He also designed and managed the Business Leadership Programme for ScottishPower plc, in partnership with Wharton Business School, Kellogg, Insead and London Business Schools as well as National Training Laboratories. He has two grown up sons and this year he became a “Grandfather” for the first time.